The Smith & Wesson MP Series One Black folding knife is equipped with a 3" modified clip blade constructed of Teflon stainless steel with Smith & Wesson MP etching. The T6061 aircraft aluminum handle has a unique M.A.G.I.C assisted opening mechanism. Includes a thumb stud. 4 1/4" closed. This knife is amazin. It surpasses all my expectations of it and more. I am amazed with the quality of it. All the part function beautifully and is very sharp. If you have a need for a quality knife thats sharp and you can rely on like i did, you will not go wrong here. Amazin american product. a very nice, durable blade. the lock holds well, and the spring is strong, but not hard to fight against to close the blade. the lock that holds it open is strong and a little stiff when trying to move it to close the blade, but not so much as to be any problem. the blade cuts and pierces rather well. i have not used the attached glass breaker as of yet, but it seems to have a good build, and the grip is almost perfect in your hand. Great knife. It has a great edge, and it locks very firmly. The spring release is a bit difficult to trigger, but that is good for not having any misfires from the knife. 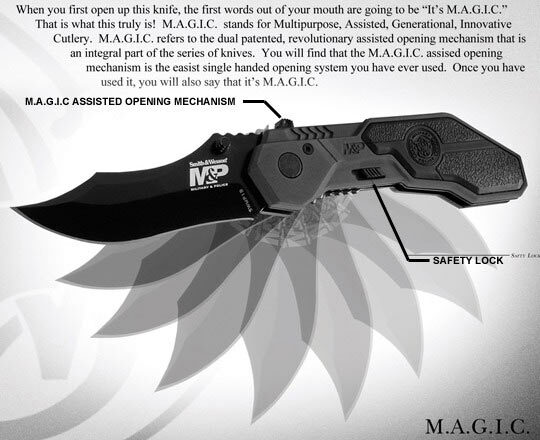 I would strongly suggest this knife if you are looking for a good reliable folder. Hands down one of the best looking and best designed folders on the market! The fact that it is open-assist is just gravy. I get more questions, oohs, and aahs of this knife than any I've ever carried. And for those thinking this is just for looks,.......WRONG! This is an extremely functional knife and I use it at work every day. I'm an EMT by the way, so I have just a little experience with these things on the job. Thanks again Smith and Wesson!